OTTAWA — Each year, more than 8,000 students audition for fewer than 3,500 positions available in the top-tier Drum Corps International member corps. This year, an Ottawa-Glandorf Junior has been qualified for one of those positions. Griffin Burwell will be touring this all along the east coast this summer with the Drum Corps International. “I’m pretty excited,” Burwell admitted. He has always enjoyed playing different instruments since he was a young boy. Last February, he was at a Drum Corp International Camp when they pulled Burwell into the hallway and told him they wanted to offer him a contract. “Ever since I was in kindergarten, I’ve been playing guitar and piano,” he said. “In the sixth grade I started playing trombone.” Burwell continued playing trombone in junior high and high school. 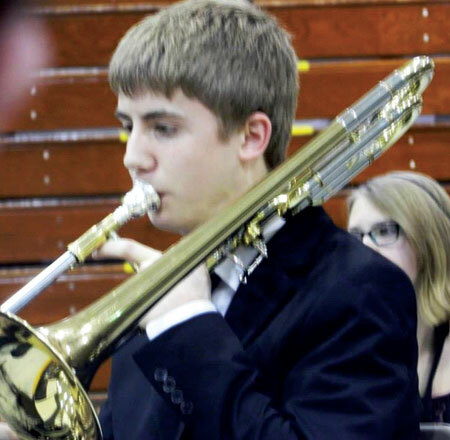 Then, in his sophomore year, he began playing baritone. It is this instrument that hw will play as a touring member of the International Drum Corps. The O-G student said he tried out in November for the Phantom Regiment Drum and Bugle Corps. He then went in December to try out for the Legend Drum and Bugle Corps. His call to attend came in February. While at the camp he learned he had qualified for what is billed as the “Marching Music’s Major League™. He was chosen to be one of the Drum Corps International. Burwell will rehearse and perform daily from June 11 to August 13. “I suppose we may have a few days to rest and relax, but most of the time we will be very busy,” he admitted. He said their schedule includes many east coast states, mid-west states and Florida. “We will be traveling by bus and our lodging will probably be at different high schools,” he said. Drum Corps International (DCI) is the non-profit governing body for junior drum and bugle corps in the U.S. and Canada. Junior corps are composed of members 21 years of age and younger. DCI is composed of member corps who have earned their membership through competition. It is responsible for developing and enforcing the rules of competition and is the sanctioning body for junior corps competitions. DCI is headquartered in Indianapolis, Indiana. Burwell said he is thinking of majoring in music production when he attends college. “I’m excited about the experience I will get,” Burwell said. “Not only in music and marching, but in meeting and working with people from all over the United States. Griffin is the son of Michelle and Thomas Liebrecht aand Edward and Jackie Burwell. That is great for you, there is nothing but positive results coming from you being a part of dci, your life is on the right track my friend and good luck in your future. This comment has been hidden due to low approval.